Dharma Forest: Joanne Shenandoah In Concert Oct. 21st! 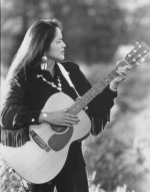 Ms. Joanne Shenandoah has drawn upon her rich heritage in establishing a reputation as one of America's foremost Native recording artists. In addition, Ms. Shenandoah has given hundreds of lecturers and workshops throughout the world, from the Parliament of the Worlds Religions, to Commencement speeches and multicultural affairs. Ms. Shenandoah appears in “The Last Winter” which stars Ron Perlman (Hellboy-Beauty and the Beast) and will premier at the Toronto Film Festival on Sept 11, 2006. In addition, she has been featured in many PBS, video and television documentaries. Native American Singers of her time” - Associated Press. Shenandoah is a Wolf Clan member of the Iroquois Confederacy - Oneida Nation. Shenandoah has 14 recordings and her music is on 40 plus compilations. Her original compositions combined with a striking voice enables her to embellish the ancient songs of the Iroquois using a blend of traditional and contemporary instrumentation. Ms. Shenandoah's music reflects the indigenous philosophy and culture which continues to have a profound effect on the world today. From traditional chants to contemporary ballads about Native ways, her music has been described as an emotional experience, a “Native American Trance”. Shenandoah appeared on stage at Carnegie Hall, The White House, Kennedy Center, Woodstock 94, Earth Day on the Mall, and the Special Olympics performances nationally and internationally. “Peace & Power” Shenandoah actually has a deeper, more powerful voice than the Irish thrush....Enya” - John Diliberto/Amazon.com. “Eagle Cries” : “One Silver One Gold”, a bluesy eco-ballad enhanced with ringing guitars, mythic lyrics and a haunting tone that would have not sounded out of place on The band's Music From Big Pink.” - New Age Voice ; ”Watch Me Through The Night” is an a capella spectacle to behold.” - Cowboys and Indians Magazine; “...rarely has inspiration ranged so far, or so consciously, as it does with singer-songwriter Joanne Shenandoah. The award winning musician is known for stylistic versatility--although she sticks close to folk rock this time out--but every one of her dozen albums shows consistent vision... Even when Shenandoah sings of violence and conflict, Eagle Cries retains its message of peace.” Amazon.com. I would love to come see that. I am part native american. I was wondering if Rev. Heng Sure is part native american too since he is from Ohio? I have a feeling that Rev. Sure was a Chinese Monk in his previous life. So you are still doing the sutra lecture right? I wanted to come down this weekend but something happened. It is okay, I am just going to meditate by myself in the house. But I hope the concert is a big smash. I hope lots of people come and that they stay to hear the dharma too!